It’s 20 years since Justin Fashanu died by suicide. 20 YEARS AGO, Justin Fashanu left a gay sauna in Shoreditch in east London, walked across the street to a dilapidated garage that doubled up as a car-park and hanged himself. By that stage, his jumbled life had got too much. He had been ‘out’ for eight years, becoming the first professional footballer to go public about his homosexuality. But, by that stage, the football had become secondary to everything else. Fashanu always cherished the spotlight and longed for headlines. But by the 1990s, football really stopped being the source of them. He became a figure of fun and he was more than willing to play along. There was the time, after he’d signed for Torquay, that he sold the story of his supposed relationship with Julie Goodyear, the actress who played Bet Lynch in Coronation Street (‘My Bet On The Side’ was the memorable headline that accompanied the splash). He hinted at bisexuality. Everything was coy. But it was all lies. Then there was his attempt to rake in £300,000 for an exclusive with The Sunday People about how he’d had a sexual relationship with two cabinet ministers from John Major’s Tory government. But, when police received a tip-off to say Fashanu could help with the investigation into the suspicious death of MP Stephen Milligan and called to speak to him, he was spooked and revealed he’d made everything up to try and make some cash. Afterwards, he was sacked by Hearts and never played in the UK again. At the time of his death, the joking really had stopped. There was a warrant for his arrest in the United States, police having charged him with three counts of sexual assault against a 17-year-old boy. Fashanu was in Maryland when the incident occurred, arriving there months earlier to coach the city’s new professional team. But, after questioning, he fled the country. In his suicide note, he professed his innocence. But Fashanu was a relentlessly complex figure who had bounced from country to country and club to club for the bones of a decade. Despite being ‘out’, he still carried the burden of a hugely traumatic childhood, the cliched trappings of fame and the pent-up anger of injury essentially robbing him of his prime years as a footballer. The last place he had seemed relatively settled, content and in good form was Canada. In 1988 – seven years after his magnificent performances for Norwich had resulted in Brian Clough paying £1m to bring him to Nottingham Forest – he signed for the Edmonton Brickmen of the Canadian Soccer League. Len Vickery had been hired to take control of a group consisting mainly of raw, unproven youngsters but Fashanu’s arrival signalled an upturn in the club’s fortunes. “It was early days in the CSL season,” he says. 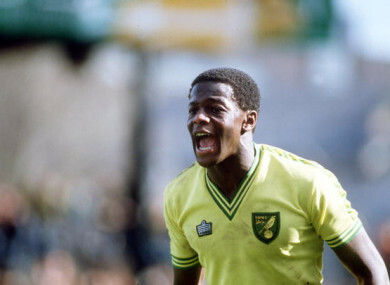 Fashanu had endured a nightmare at Forest. As much as stories of him frequenting local gay bars irritated and bemused Clough in equal measure, there was also a huge personality clash. Clough was the definitive presence. Fashanu, opinionated and outspoken, threatened that. It was only going to end one way. But, Fashanu later did well at Notts County and the upward curve seemed to continue at Brighton before he suffered a knee injury so severe that doctors advised him to retire. Instead, he headed to the US for surgery and played some low-key games in LA to help him get his fitness back. Then, he got the call from the Brickmen. Vickery, a recent arrival to Canada from England, knew the affect Fashanu’s arrival would have on the fledgling CSL and the team. He was a big draw. It meant media, headlines, the spotlight. Everything Fashanu loved. Though he also wanted increased responsibility. “Justin brought along a very strong goalkeeper in Bobby Amman so that brought a little bit of senior content into the team,” Vickery remembers. “But Justin wasn’t just satisfied with playing. He wanted to run the whole affair. So I got ousted a little bit in favour of Justin but he asked me to stay on as a coach to work with him and we were with the team for a couple of years. In 1989, Fashanu struck 17 goals and was voted as the league’s Most Valuable Player as he was crucial to Edmonton making the championship semi-finals. It was a rare personal accolade and would be his last. “I think he enjoyed it in Edmonton,” Vickery says. The knee continued to pester and frustrate. Fashanu had to come to terms with it though it’s hard to know if he ever did. Instead, it was more likely added to the list of troubling, traumatic things that he preferred to pretend didn’t exist. “I’d be theorising but I’m sure – as with anybody – those kind of injuries, when you’re in the prime of your athletic career, can only be a major downer,” Vickery says. In late-1989, he made two substitute appearances for Mel Machin’s side. It was a triumphant return to the top-flight, but it was fleeting. It was clear that no high-profile team would take the insurance risk, given the issues with his knee. And so began the nomadic stage of his career: short-term stints in Canada (again), Sweden, Scotland, New Zealand and the US was the best he could do. And the focus switched too. Football wasn’t the motivator anymore. It was about keeping the show going – with him as the lead character – no matter what it took. Vickery was fond of Fashanu. There was no bad blood. There were no unpaid loans. No scar tissue of any kind. Perhaps he’s just one of the lucky ones or maybe it was because Fashanu genuinely enjoyed his time in Alberta. “He loved the North American lifestyle – something I can appreciate,” Vickery says. He landed in LA and that was the place he should’ve been, being a larger-than-life character. So he enjoyed it there. But equally he enjoyed it in Edmonton because the level of pressure wasn’t as great as what he would’ve experienced back home playing at the highest level. But he had an opportunity to do more than just be a performer on the field. He took it upon himself to try and pull all the groups together in Edmonton for the greater good. Vickery acknowledges there were rumours about Fashanu – who still hadn’t publicly come out at that stage – and his off-field behaviour during his time in Edmonton. But, it never became a problem for the organisation. “I think he had some demons,” he says. When news of Fashanu’s death filtered through to Edmonton in 1998, Vickery was stunned. I have no idea where I was. I do remember it hit me for a loop. And then as the story unfolded, it wasn’t very pretty. “But, you have to put the whole story into perspective. He and his brother were orphaned at a young age. They were placed into a Bernardo’s home. He and John were brought up by an older couple outside of Norwich but their birth mother was still around. They grew up and got to play soccer and did exceptionally well. They had a bit of a rough beginning and leaned on each other for support, even though they had a very good foster family. 20 years on from his death, it’s hard not to dwell on the person Fashanu became. But, there are plenty – like Vickery – who choose to remember a different version. “I will always remember the best qualities of Justin,” he says. Email “'He had some demons but I think you have to put the whole story into perspective' ”. Feedback on “'He had some demons but I think you have to put the whole story into perspective' ”.